The Blackhawks are currently losers of their last two games, both by one goal, and find themselves with a mediocre record of 6-5-1 on the year. Tonight they’ll be going up against a very good Canadiens team at the Bell Centre in Montreal, one of the league’s toughest road venues. All signs are indicating that tonight could be another disappointment for an almost desperate Blackhawks team. While that may end up coming true, I’m going to do my best at explaining why any night now could be the Blackhawks’ breakthrough game. There’s a whole lot about the Blackhawks that doesn’t make sense right now. They are fifth in the entire NHL in fewest goals against per game with a 1.92 average, third in the league on the penalty kill with a 91.9 kill percentage, and have allowed the sixth fewest shots per game in the NHL. Yet their record is 6-5-1, which makes you scratch your head. Then you look at their offensive numbers, and those don’t really compute to a 6-5-1 record either. The Blackhawks lead the NHL in shots per game with an average of 38.4, which is a ridiculous number, but they rank twenty-sixth in goals per game at an average of 2.25. How can a team lead the league in shots and score such a low number of goals? Well, there’s somewhat of an answer to that question. You can average 50 shots per game, but if those are not real quality shots, you’re not going to score goals. That’s the problem with the Hawks right now. They are putting the puck on net better than anyone in the NHL, but the quality of their shots has not been great. Their net-front presence has been severely lacking for the most part, and it is imperative to have someone, or multiple guys, standing in the shooting lane screening the opposing goalie. Too often this year have the Hawks all been spaced around the outside of the shooting lanes and not in front of the goalie obstructing his vision. That is not a hard fix and something that they’ve never had too much trouble with in the past, so I’m expecting some improvement there real soon. Another problem that the team has had, especially recently, is the fact that they keep running into hot goalies. Two games in a row at home now they have been shut out by a rookie. In Toronto this past weekend, the Hawks had over 25 shots in the third period (most were actually quality shots) and failed to get just one past James Reimer for the tying goal. Last month at home against Calgary, the Hawks registered 50 shots on goal, only to lose the game in overtime 2-1. It’s been that type of luck that the Hawks have faced this year. A team with as much talent as the Blackhawks will see that luck change sooner than later. Here is why we should stay optimistic. This will most likely be the lowest point of the year for the Blackhawks, at least I would hope. They really aren’t playing bad hockey right now, although certain areas definitely need improvement. If they were playing awful hockey and losing these game, then yeah I’d be worried, but that’s not the case. They are one of the best teams in the NHL at keeping the puck out of their net at even strength and on the penalty kill, which is a must come playoff time. Sure they’re not scoring right now, but that’s bound to change. 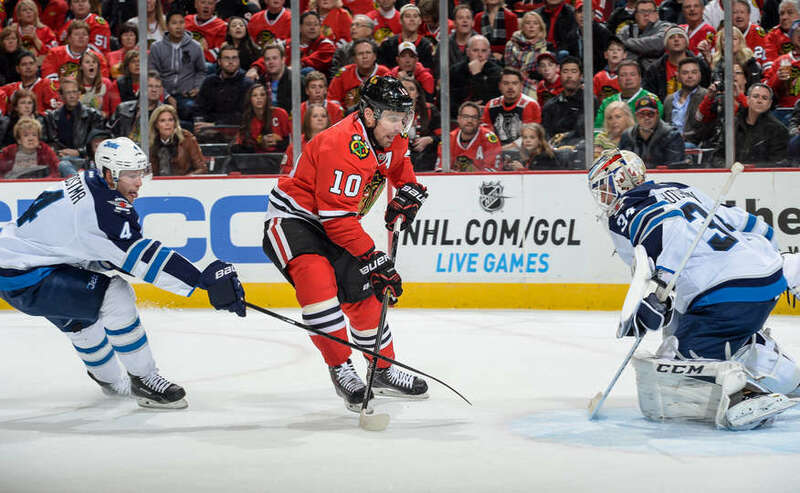 The numbers that the Blackhawks are putting up right now are unsustainable, in a good way. A team that generates as many shots as they do will not be kept from scoring like this for too much longer. It’s only a matter of time before the floodgates open and this team starts to look like the team we’ve become accustomed to over the past 5 years. If you need anymore optimism, take this: last year’s Stanley Cup winner, the L.A. Kings, ranked twenty-sixth in goals per game and first in fewest goals against per game. In the 2011-12 season in which L.A. also won the Cup, the Kings ranked second to last in goals per game, and second in fewest goals against. I’m not saying that the Hawks’ offensive numbers will stay that low, but the point I’m making is that the good teams who are great defensively are the one’s who win Stanley Cups. Right now, the Hawks would fall into that category. Their breakthrough performance should happen anytime now. Numbers don’t lie.